Last week refugees from across the country convened in Washington to share their stories of survival and determination. As part of the annual Refugee Congress, refugee delegates from all 50 states attended plenary meetings and workshops to advocate for the nearly 65 million displaced people in the world today. These meetings came on the heels of the previous week’s U.N. General Assembly and President Obama’s Leaders’ Summit on Refugees, which led to increased commitments from some nations on aid and resettlement. But amidst the contentious debate over the refugee resettlement program, political will still falls short compared to the scale of the crisis. The delegates spent most of their day on Capitol Hill meeting with lawmakers to share the stories of their integration and contribution to each state, urging members of Congress to continue the American tradition of protecting the persecuted through refugee resettlement. Human Rights First staff accompanied refugee delegates from North Dakota, Wyoming, and Texas throughout the day. 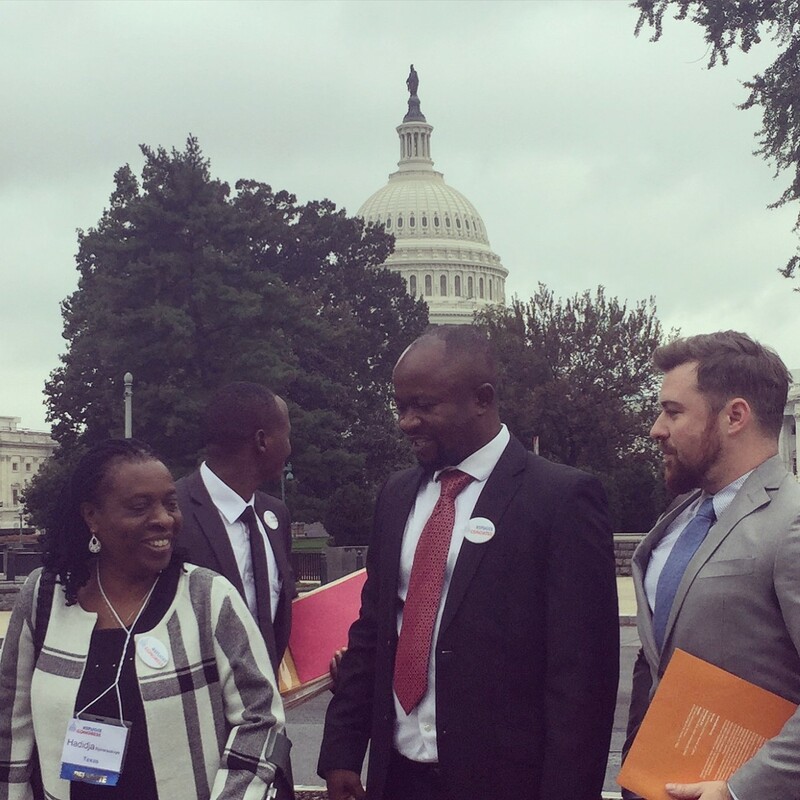 Refugee advocacy strategist Jennifer Quigley escorted 19 year-old Kalisa Ndikumwimana of the Democratic Republic of the Congo (DRC), and the pair met with members of Congress to share Kalisa’s story. Kalisa, who grew up in a Rwandan Refugee camp, resettled in Fargo, North Dakota in 2011. Now he works as a pharmacy technician and school translator in addition to helping youth from his community as part of the Lutheran Social Services of North Dakota. Scott Cooper, our National Security Outreach Director and founder of the Veterans for American Ideals initiative, partnered with fellow Wyoming resident Valerie Bahige to meet with Wyoming Senators Enzi and Barrasso as well as Representative Cynthia Lummis. Valerie fled the DRC more than six years ago, surviving in a refugee camp until he was welcomed to the United States last year, where he is now a proud resident of Gillette, Wyoming. He’s an active member of the Gillette community as well as a spokesperson for his fellow refugees. Fellow Veterans for American Ideals leader Joe Jenkins, a Texas native, escorted delegates Jean Claude Mauridi, Hadidja Nyiransekuye, and Alexis Niyonkuru to the offices of Texas Senators and Representatives. 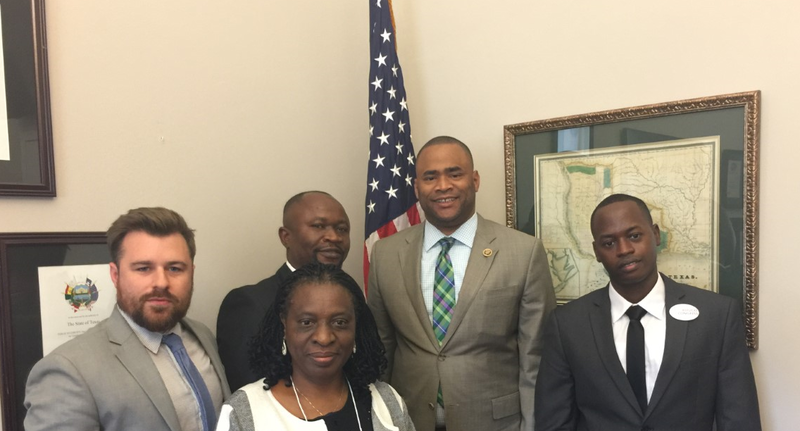 Texas Representative Marc Veasey listened as the delegates, each a survivor of genocide in the Great Lakes region of Africa, told the story of how they found their home in the Lone Star State. “I was only a boy when I saw a man killed in front of me for the first time,” said Alexis. In his new home Alexis founded UBAHO, a Houston-based organization that helps Burundian refugees integrate into the community. Staffers from the offices of Senators Ted Cruz and John Cornyn were moved by these stories, absorbing the Refugee Congress delegates’ message of hope. For the delegates and the millions of refugees in the world today, it’s up to Congress to not only listen to these stories, but to fully fund the refugee resettlement program and muster the will to make the United States a leader in the global crisis.